The first house my wife and I owned was brand spanking new – right out of the box. We walked in to fresh paint, clean carpets, new appliances and a cute little covered porch right off the back door. Everything was so perfect…so new. We had no home remodeling costs to speak of. A few years and two kids later we decided it was time for some more space, so we moved into our second (and still current) home. While nice, this home was, well…not so new. The carpet was bad, EVERYTHING in the kitchen was dated, the deck was falling apart and who could forget that rust-toned, orange paint in the hall bathroom. Of course we were thankful for finding a home to fit our growing family needs. But we knew changes to the home were in order…starting with the hideous orange bathroom. Once the bathroom paint was satisfactory to our eyes, we set out creating a home projects to-do list. Needless to say it became quite long. In fact, 12 years later several of the projects on that list (like finishing the basement) have not been completed. It has been fun transforming this place into “our home.” It’s taken some time and a good amount of money but it’s now very pleasing to our eyes. If you are new to home ownership and have a remodeling to-do list a mile long, you may be confused on where to start. Many would suggest starting with those projects that will bring the best return or create the most value for the money you spend on it. That’s why we repainted that bathroom within a month of moving in. It was a cheap fix and every morning it burned my eyes when I walked by. Plus there was no way we were having visitors over and force them to experience that room. Almost all of our other projects have been more expensive. They required us to be patient and save money to fund their completion. None of our projects have been paid with debt. That’s going to be a big trap for you as a homeowner. You will want to get projects done right away. Instead of being patient and saving for all your home remodeling costs, you’ll choose to put it on your credit card or take out a home equity line of credit. Many people choose that route and have gone deeper into debt seeking that immediate gratification. My advice is to be patient and save for your renovations. Home remodeling costs can be extreme, especially once your emotions get involved. Envisioning how that brand new kitchen in the store showroom may look in your home may cause you to make a bad financial decision. Of course, these home remodeling costs are just estimates. Your project cost will vary based on many factors including in which region of the country your home resides. But what should immediately stand out to you is the wide margin in price involved with some of these projects. Before you know it, what planned to be a $20,000 kitchen remodel could quickly balloon to $54,000. If you weren’t planning ahead and chose to take out debt to finance it, you could be left paying off that kitchen remodel bill for years. Take your time with home remodeling projects and weigh the cost. Always make sure to get multiple estimates. According to the pros at Art Construction, as many as “three or four contractors should be called to the property to inspect and estimate.” Not everything has to be done at once. We all want our houses to look good but we don’t need to go overboard and break the bank to do it. Questions: We had an orange bathroom – What one thing just “had to go” when you moved into your home? What was the biggest home remodel project you completed? How have you financed your projects? Did one project turn out to be more than you expected? Would you ever spend $54,000+ to completely remodel a kitchen? Next Post: What Do I Need to Know About Homeowner’s Insurance? Wow, these are so impressive. I wanna say that, really amazing. The work that needs to be done is beyond our scope, so we’re having professionals do the work, which is nice but it still a very time-consuming process! Thank you for the ideas for the home renovation. I positively like the idea to consider your needs and goals for a home remodel. That helps you set a budget and design your idea around that budget. Home remodeling is the thing that need attention as it can be more costly than you expect if you do not choose the right contractor or the materials(if you are doing by yourself). So, it is advisable to know the correct prices of the remodeling. I really appreciate this beginners guide shared here, it will help many people to have an idea about the cost their home remodeling will going to take. Thanks for sharing. Great post! Love the chart that shows the sots of remodeling different areas in your home. Thanks for sharing! Landscaping can increase a property’s value by making it more attractive. A well-manicured property with appealing landscaping is often a selling point for a home. The landscaping can also improve your home’s appearance to match similar homes in the neighborhood. Accurate pricing, Brian. Thanks for shaving — I love especially the infographic. Saved this for future use. Great tips and the key is to strike a balance between the project and the cost. Of course, in order to reap the financial rewards of any project, you have to do your research to make sure that your output will not far exceed the input or the added value to your home. Nice tips. Great post! Home improvement projects can be very fun and add a lot of value to your house! Thanks for sharing! The Art Construction suggestion for the number of quotes people should seek is a fair one. Getting the best estimate can save thousands. The costing list is not good enough. It seems some expensive items in your home remodelling cost list. But I am searching for the little bit low cost for my new home remodelling. Actually, I buy a new home. We will shift our new home as early as possible. But we need to remodel our home. But our budget isn’t so high. Can you suggest me some low budget home remodeling list? Home remodeling will add new style and function to the heart of your home. Readers will make their next home remodel go smoothly with these helpful tips and ideas. Thanks for sharing this. The common reasons why steel products are widely used in construction because they are durable, versatile, and affordable. Because of its high strength to weight ratio, resistance to breakage, steel is very durable, making it ideal to use it for buildings. Aside from its durability, and flexibility, it’s also environmentally friendly, as it is continuously recyclable. Great tips! I always want to renovate or remodel our home but i dont know where to start and thanks to you i got an idea. My wife and I want to remodel our kitchen. However, it’s our first time so we don’t really know where to start. Thanks for the tips on how to start. I’m going to take your advice and figure out what we can afford first! I think we went through something similar to you about 15 years ago. We now have teenage kids and I look around the house and am definitely beginning to think maybe we should start all over again. Gulp! Setting a budget for home remodeling is an overwhelming task, Thanks for the really good estimate. I am very optimistic in this post with the price info-graphic. It can be overwhelming. I think you just have to take one project at a time and stick to what you can afford. Remodeling is one of those expenses that can get out of hand quickly if you let it. Every home remodeling project is going to be different. Do your research so you can make the best decision for you. Thank you for sharing. Don’t ignore the floor.It doesn’t get much attention, but scuffed, worn flooring makes a space feel tired. Refinishing wood floors and replacing old, matted carpet can revive a room without changing anything else. Landscaping is critical when selling. It provides buyers with an insight into how the owner looks after their home. A well presented home from the street with manicured gardens and landscaping shows buyers that the owners take pride in their home and will certainly influence the sale price. We’re saving up for a renovation next spring and summer! Thank you for including that infographic so we can get an idea what our budget should be. We haven’t hired a contractor yet, and probably won’t until we’re ready to start. When do you think would be a good time to get an estimate, if the project is anywhere from 4-6 months away? I really appreciate you pointing out that saving up and not doing all the projects right away is going to save money and avoid debt. I definitely want to remodel our new place so badly! The kitchen is not very functional, and is just laid out horribly. We would have to go into debt to do it, though, so I will be patient and wait! Just looking at the graph make me wonder about my own home and how it would need to be remodeled. I wonder though, would a structural engineering contractor be able to help out? This is a question that came to my mind because of my home and how it’s actually falling apart. Just yesterday my wife showed me pictures of a long crack that’s separating the kitchen from the garage. Thank you for including that infographic with all of the cost details. I mean, it really depends on the quality of the supplies you get, and how large your house is, of course. But there are a lot of things in there that I didn’t think of. Great post. Love the infographic. 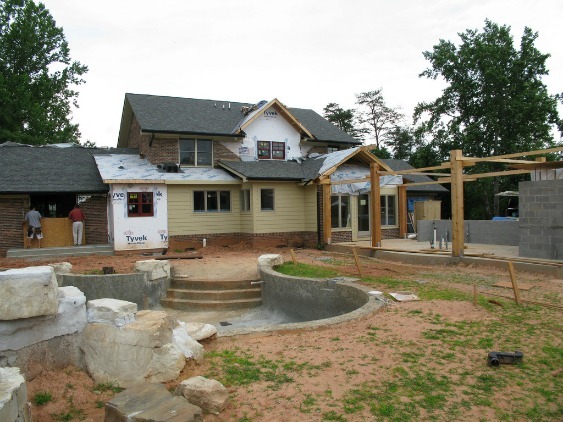 Home remodeling can be very expensive, but if done right, it is well worth the money spent. Thanks for sharing! This is a really good budge estimate. Of course, it is important to remember the slight variations from city to city and region to region. It is also important to sit down and make a plan of what you will be able to do yourself, versus what you will need to hire out. Sometimes you can find great places to save money as well. Sanding and refinishing existing trim can be a huge money saver. While refacing cabinets is much cheaper than replacing, there is also the option to simply refinish them. Doing your research on the little cost savers can add up to big cost savers! These are really helpful remodeling estimates! My husband and I are doing a few small remodeling projects around the house so it was nice to see about how much it might cost. I think the first thing we will start with is replacing the living room carpet. Remodeling a house certainly costs a lot but I guess we can’t ignore these expenses. Recently, my husband and I have bought a house and it definitely needs lot of renovation especially the kitchen, bathroom and master bedroom. But we have not been able to decide that from where we should start. The infographic that you have mentioned helped us a lot as we were able to estimate on what things we can spend money right now. Renovations can produce a great deal of waste if not handled properly. Here you can learn about the management issues you should consider, the availability of green building products, indoor air quality problems that might arise, how to reduce renovation waste and how to dispose of the remaining waste properly. REALLY great infographic. Makes ballpark remodeling costs really accessible for new homeowners or anyone looking to do a remodel. Hey, i really like the info graphic you put up there. We also thinking for a whole redo. Perhaps in a few month. Me and my wife are looking to design a luxury bathroom. Currently we have a moderate bath with all the essentials. But we need something more impressive than that. Saved that info graphic you put up there to my evernote for future reference. Cool…thanks John! Best of luck with the bathroom redo. We did ours several years ago and it made a big difference. Home remodeling definitely costs a lot but in my opinion is definitely worth it! Me and my husband have also bought an older house two months ago and now some renovations works are going! We bought the house very cheap and we almost didn’t have to take a credit for it. We cleaned it, fixed the bedroom and the kitchen temporary and everytime we earn some money we invest in fixing the rest. Gladly, we have no children yet so we feel a bit more free. Thank you for the post! It is really interesting and useful for me! Greetings! I can certainly testify that entire home renovations can be stressful and expensive, which is why I’ve normally done one or two rooms or projects a time. However, like you, we recently bought a new home, and the entire place needs to be redone in at least a few ways. The photo you shared that outlined the budget for a whole home make-over seems like a great way to break up the costs visually, but I’m wondering about the flooring price. We would like all new carpets in the house, so is that price range a standard for the whole home or just each floor? We would like to stay on budget, and I’m worried new carpets may break the bank. Carpets can be real expensive. If I was going to replace carpet I’d try to anticipate what my long term goals were for the house…how long I’d be staying. It might be worth it to buy a cheaper brand/style if you anticipated moving in 5-7 years. It also might be worth it to replace carpet every 5-7 years instead of going for the expensive brands that say they will last for 15 years. You’d have to run the numbers and see. Brian, thank you for responding. I was considering installing the cheaper carpets and then replacing them every few years, but I think the task of pulling up and replacing carpet throughout the house every few years wouldn’t be worth the money I might save otherwise. However, thank you for the advice! It would still be very helpful for high traffic areas that wear faster than other rooms. We remodeled our home last year. If u don’t plan ahead and stick to a budget you will end up in debt. still there will be unexpected costs. I think choosing the right vendors and manufactures matters too.If you are not careful you will end up paying more for a low quality product. You should keep an eye out for offers and discounts. You will never know when you will get lucky. When we approached heritage home design for door installation, they were having a 40%off.That was a pretty good deal. It definitely takes some discipline to stick to the budget. It’s so easy once you get into the project to get excited and do things you weren’t planning on. My parents are moving into a home with a significantly unfinished basement. They just want it to be able to house a simple family room. Are there any simple updates you could recommend for an unfinished basement? From what I’ve seen, even you calculate all costs before the project, there is always something else that will come up. Assessing a plan before starting a remodelling project of your house is vital, but still one has to be prepared for surprises, many of them expensive. Another important issue is dealing with the refurbishment waste, which can be a nightmare at some locations. I like your two focus points on getting started in remodeling. Getting the most bang for your buck is a great way to look for it. Sometimes taking down some wallpaper or putting in some hardwood floors can be on the cheaper side but make a huge difference. And new doesn’t always mean better. Sometimes some repurposed furniture can make it all work. We replaced our downstairs carpet with hardwood floors and it made a world of difference in appearance. Also cut down on a lot of dust and dirt being trapped in the carpet. Really a nice article. Thanks for sharing Brian. Home renovation helps in enhancing the whole appearance of the home as well as often increases property value. If you doing proper plan and create a checklist of materials, home renovation can be easy. There are few things Canadians have to realize about renovations and additions.Number one is getting proper building permit and inspection.When you sell your flip, you may not be able to claim all expenses. You need to have proper Canadian real estate investment training and coaching before jumping in fix and flip. Looking forward to read your next blog. I don’t think you could get a good window in Winnipeg for $300. We just replaced 6 windows for $6000. They are triple glazed and low E of various sizes and at least a portion can be opened. Our one “had to go” item when we moved in was the kitchen lighting. There were fluorescent strips above the cabinets covered by a horrible dingy plastic shade that curved from the cabinets up to the ceiling. We ripped that out as soon as we moved in, even though it took a few years before we were ready to remodel the whole kitchen (including some high hats and under-cabinet lighting). I can’t imagine spending $54k on a kitchen though. Our kitchen renovation was planned from the start, so it was mainly financed with funds we had at purchase, although we did save up a bit more in the time leading up to it. We managed to put off the kitchen until the cabinets were literally falling apart. Hopefully we won’t need to wait so long to get the bathrooms redone. We have some fluorescent lighting in our kitchen too that I’m not totally pleased with. Makes it real bright, just not very inviting. Feels like an office kitchen at times. Brian recently posted…Keep Your Emergency Savings Fund Under Your Mattress? I’d agree DC…in some instances that amount of money might make sense. I’d argue the kitchen is the most important room in the house. How often do we entertain and everyone hangs out in the kitchen? Happens at our house all the time. I want that room to be inviting and functional in the best possible ways. Brian recently posted…What Do I Need to Know About Homeownerâs Insurance? We are coming up on several things that need to be remodeled in our home. I think about 10 years is some sort of timeline for things to fall apart! Our thought process is to get the house paid off first over the next few years and then we can remodel like we want. I wouldn’t spend $54,000, but I know enough to know what I do and don’t want at this point. No I would never spend $54,000 on a kitchen but my house is only worth about $190,000 and I live in an area of the country where real estate doesn’t appreciate much. As for projects we have had a constant slew of smaller projects since we moved in ten years ago like new driveway, painting, new carpets and adding a french door. I think that’s a wise move Scott. Our house valuation is similar and I wouldn’t put 1/4 of it’s value into the kitchen. We recently bought a new home and are in the midst of doing some remodeling, mainly the kitchen. I love to cook and the kitchen needed some major work. The work that needs to be done is beyond our scope, so we’re having professionals do the work, which is nice but it still a very time-consuming process! “…we’re having professionals do the work…” I’d do that too if it was very involved or if I just didn’t want to spend the time. I rebuilt our deck and installed our hardwood floors but I didn’t finish our garage as I hate hanging/finishing drywall. The last home I bought was a major fixer upper but I had a lot of fun transforming it into a home. I’m not sure if I would do it again, but one thing I know is that the money for repairs will start to add up if you don’t make yourself stick to a budget. “…if you don’t make yourself stick to a budget.” That’s why you really have to check your emotions at the door. If you don’t the spending can get way out of hand. I was just talking about this with my youngest brother over the weekend as he wants to buy his first house and he’s not fully realizing when you buy a house that it’s all on you. Anyway, we really didn’t have an orange bathroom kind of thing with our house but have made a few changes. I think our biggest was remodeling most of our master bath which cost us about $6,000. We just saved for it so we could pay for it outright. I couldn’t imagine spending $54k on a kitchen – especially in our current house as that would be about 40% of what we paid for the house. John recently posted…Amazon Dash Button – What’s Convenience Worth to You? “…when you buy a house that it’s all on you.” That is so true John! The minute you move in it seems something needs to be taken care of. That’s why it’s so critical to be financially ready before buying a home. There is absolutely nothing wrong with renting until then. We purchased our home from the original owners who lived in it for 25 and over that period of time, the wife, who was an artist painted every last inch of the home. Some of the painted rooms were nice and we kept it while other’s were just too much for us. We painted a few rooms before we moved it, but everything else we have budgeted and planned for over a period of time. It can be easy to get carried away with home improvement projects, but you have to keep the costs and needs in perspective. Our house is still a bit new so there’s really need to remodel it, but I’m planning to paint the outer part of our house. The paint blue color is already fading and I want to change it to a new color. I think what many people don’t realize is that exterior paint is more than just about aesthetics. The paint actually serves to seal up and protect the siding on the house. If someone lived in a home for 30 years they’d probably have to repaint 2-4 times over that span (depending on where the home is located). Home improvement, by definition, is making changes to one’s home by making improvements on the house’s looks. Home improvement is usually done by professional contractors, handymen, and even the house owner himself. Every house or office has different construction materials needed as their structure, use and base work is different. Talk and discuss this matter with your constructor. If you’re planning to buy your material online then make sure that the website and company are legitimate and they have a good reputation as well. Compartmentalized bath — two baths in the space of 1 1/2 baths. Each kid doesn’t need a personal bathroom, but does need privacy and room to share. A compartmentalized bath puts two sinks in one room and the toilet and tub/shower in another, so three kids can use the bath at once and keep a little more harmony in the family home. Home modifications are changes made to adapt living spaces to meet the needs of people with physical limitations so that they can continue to live independently and safely. These modifications may include adding assistive technology or making structural changes to a home. Modifications can range from something as simple as replacing cabinet doorknobs with pull handles to full-scale construction projects that require installing wheelchair ramps and widening doorways.